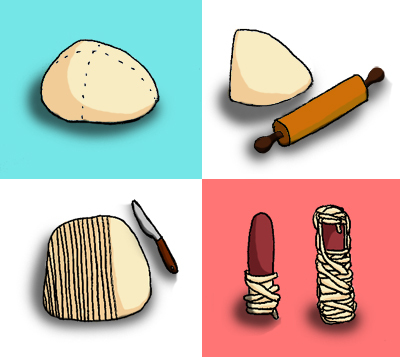 Diamonds for Dessert: II: Mummies! Monster of the day: Mummies! Because I usually spend most of my time baking sweets, I thought I'd be good to include at least one savory treat in my Halloween baking fest. 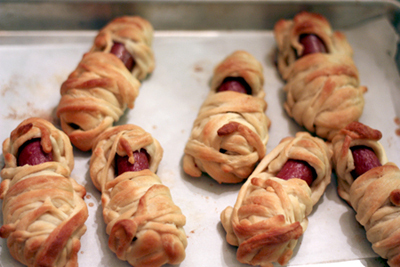 On the Pillsbury website, I saw a recipe for Crescent Mummy Dogs and thought that the mummies were pretty cute and perfect for Halloween. Since I love making things from scratch, I opted to make my own bread dough to use for shaping (but if you don't have time, instant crescent dough will work in a snap). I used a roll recipe from America's Test Kitchen along with the general idea from the Pillsbury recipe to create this Halloween snack. Melt the 4 tablespoons butter in the microwave and set aside to cool. Warm the milk in the microwave. It should be hot but you should still be able to touch it without being burned (typically I microwave it in my glass measuring cup for 15 seconds and add more time if necessary). If using active dry yeast, add 1 teaspoon of the 1/4 cup of sugar to the milk and then add the yeast. Mix it all together and let it proof for 10 minutes. While waiting for the yeast, in a large bowl, mix 2 cups of flour, the salt, and the rest of the sugar and make a well in the center. 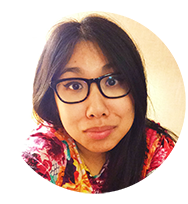 (If using instant yeast, the yeast can be directly mixed in the the dry ingredients; proofing is not necessary.) Once the yeast is bubbly, pour the milk/yeast mix into the well. Then pour in the melted butter and the egg and extra yolk. With one hand, gently mix the liquid ingredients in the center of the well, breaking up the egg yolks until the mix is relatively even. Then slowly mix the flour into the well until the dough starts to come together. At this point, if the dough is too sticky, slowly add in that remaining 1/2 cup of flour, 2 tablespoons at a time until the dough no longer sticks to your hands. Gather the dough into a ball and place it back into the bowl. Cover the bowl with plastic wrap and place it in a warm place to rise for an hour until doubled in size. While waiting for the dough to rise, prepare your hot dogs. Bring a large pot of water to a boil. Once boiling, place your hot dogs in the water and allow them to boil for one minute. Then remove the pot from heat and drain your dogs. Lay them out on paper towels to dry. This step for people with milder tastes; if your tastes are on the heavier side, feel free to skip this step. When the hot dogs are dry, cut all of them in half cross wise. Once the dough has doubled in size, punch it down and scrape it onto a large smooth surface, like a large cutting board or a piece of plastic wrap covering the table. Divide the dough into four separate pieces. Take one piece of the dough and place it onto your surface, keeping the other three pieces covered up so that a skin doesn't form. With a rolling pin, roll your dough very thin, to a 1/8 inch thickness. Then with a knife, cut the flattened dough into long, thin strips. Remember that your dough will puff up a little more in the oven, so try to keep your strips rather narrow. Take a hot dog half and a dough strip, begin the wrapping process. Starting from where you cut the hot dog, wrap upwards, making lots of visible overlaps to imitate the bindings on a mummy. Use as many strips as necessary to ensure that your mummy is well covered (I used 2-3 per hot dog half), but be sure to leave an empty gap about 2/3 the way up so that your mummy will have a face. 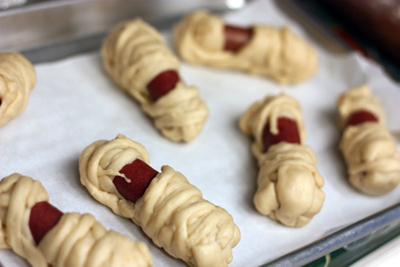 Once you're satisfied, place the mummy dog onto a parchment-lined baking sheet. Repeat with your other hot dogs. Once you run out of dough strips, uncover another piece of your dough, roll it out, and cut it up. Repeat above steps until either all the dough or all the hot dog halves are used up. 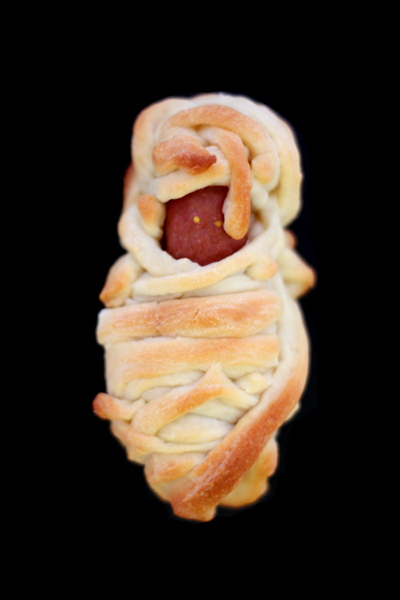 Extra dough can be shaped into rolls and baked along with the mummies. Extra hot dogs, well those can be eaten as a snack or refrigerated for some other purpose. Once all the mummies are on their baking sheets, let them rise for 30 minutes. While waiting, preheat your oven to 350°F and melt your remaining 2 T of butter. When the bread is done rising, brush all your mummies with the melted butter and place in the oven for 15-20 minutes, or until they turn golden. Then remove them from the oven and let them cool on the sheets for 10 minutes. Once the bread has cooled off slightly, take either mustard or ketchup and with a toothpick, dot on eyes onto the hot dog faces (and maybe a smile if you like friendly mummies). Just a warning, if the mummies are still hot, there's a big chance that the eyes will evaporate away. But no worries, they can just be quickly redone. Serve with a side of ketchup or mustard if desired. Very Cute! And I like that you don't use the refrigerated crescent rolls. I am going to have to try this. The are extremely cute! Haha the first picture looks like baby jesus! I've tried these with crescent rolls and they were yummy, but I bet they are delish with homemade bread! Julia: Thanks! Hope it goes well. veggie wedgie: Thank you. Haha, I guess I overwrapped my mummy :P.
Karly: I've tried pigs in a blanket with crescent rolls a long time ago, pretty much the same concept I guess. But yeah, homemade definitely ups the deliciousness factor. do you not roll a cheese slice in them, like in the original pillsbury recipe? do u like it better w/out cheese? Nope, I leave out the cheese because of personal preferences. But feel free to add cheese if you like.